A list of papers with very high quality will be selected to be extended and submitted in different special issues. To be announced! Selected contributions will consider to be published in the book series of Springer: Contributions to Statistics. For the selection procedure, the information/evaluation of the chairman of the session in conjunction with the review comments and the summary of reviews, will be taken into account. 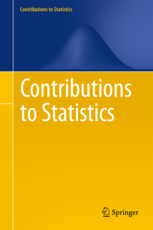 "The series Contributions to Statistics contains publications in theoretical and applied statistics, including for example applications in medical statistics, biometrics, econometrics and computational statistics. " Click here for more information.